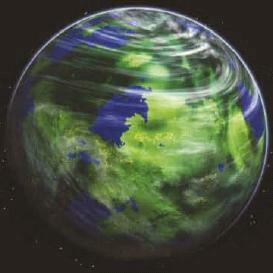 Muunilinst was the third planet in the Muunilinst system and was a lush world of forests and plains. It had a liquid iron core, a strong magnetic field, and was volcanically active throughout its known history. Its shallow oceans contained hundreds of "smokers," conical volcanoes built up by powerful vents in the crust. One of the wealthiest worlds in the galaxy, Muunilinst was the home of the InterGalactic Banking Clan. The native Muuns turned the world into an immense center of commerce, despite its distance from the Galactic Core. Gleaming marble edifices dominated the stately cities of Muunilinst. Columns, capitals, volutes, acroteria, and entablatures can be found throughout the Muun architecture. These classical structures would become marred by warfare on rare but devastating occasions. The greatest Muun city was Harnaidan, the headquarters of the IGBC. Built around a series of magnificent spires reaching four kilometers into the sky, Harnaidan had a population of more than fifty million. It was built above caverns containing vast, naturally heated lakes, enormous hot springs heated by magma vents. While the higher castes go about their daily business, lower castes swim through the rich waters, collecting mollusks and algae. Harnaidan was, unfortunately for the Muuns, mostly leveled during the battle in the Clone Wars. A skyhook connected Harnaidan with High Port, an orbital city. The Golan space defense platforms defending Muunilinst could be seen from here, as well as a magnificent view of the planet glittering below. Mariunhus was a particularly rich city built around a smoker rich in gold, platinum, and other precious metals. Mariunhus was an example of a "vault-spire," a virtual mountain of wealth, kept safe and secure, which could be mined at a moment's notice to guarantee credit anywhere in the galaxy. Other smokers were known for industrial metals and were known as "mine-spires." Muunilinst, all throughout the Galactic Republic era, had a knack for funding potentially profitable enterprises throughout its sector, regardless of ethics or loyalty. It provided much of the funding for the nearby Human colony world of Sartinaynian, which, ironically, broke away from the Republic because of anti-alien sentiments. The banking clans of Muunilinst were uninterested in these prejudices. They funded colonies, trade guilds, and corporations all along the Braxant Run. Eventually, both Muunilinst and Sartinaynian came to be member worlds in the Republic, and Muunilinst became one of the greatest financial powers in the galaxy. When the Republic established the Galactic Credit Standard, the InterGalactic Banking Clan was its guarantor and distributor. The corruption of the Banking Clan was largely unchecked as the Republic fell into decline, and with the looming threat of the breakdown of law and order, they invested in thousands of Hailfire droids to discourage customers from defaulting on their loans. Consistent with its reputation for playing both sides, Muunilinst simultaneously backed the currency of the Republic and the Confederacy of Independent Systems during the Clone Wars. Dalliances with the Confederacy, however, led to Separatist forces building droid factories and munitions depots on Muunilinst, over the objections of most of the native Muuns. Desperate, they turned in secret to the Republic for aid, even while San Hill and the IGBC collaborated with the Separatists. This led to a series of ruinous battles. During the Battle of Muunilinst 22 years before the Battle of Yavin, Obi-Wan Kenobi, Anakin Skywalker, and Voolvif Monn retook the planet for the Republic, but at great cost. The Separatists fought savagely to hold the planet, with waves of battle droids and a special platoon of IG lancer droids led by bounty hunter Durge. Confederate gun emplacements operated from within the cities, leaving Republic forces no choice but to assault the cities directly. The battle devastated the Muun infrastructure and led the galaxy to the brink of financial ruin. The Republic persevered, and Kenobi was able to capture the Banking Clan leader, San Hill. When the Empire came to power, Muunilinst became a key Imperial world. Many Imperials harbored no fondness for aliens, especially those who had associated with the Confederacy, but the mineral riches of Muunilinst were too important for the stability of Imperial credit. Muuns' lending and business operations were hampered by harsh Imperial decrees and the presence of Imperial monitors stationed throughout the world's financial institutions. Muunilinst was no more loyal to the Empire than it was to the Republic or Confederacy, but found it expedient not to undermine Imperial power, reasoning that, no matter the outcome of the Galactic Civil War, the victor would be forced to keep doing business with the Muuns and the IGBC. The head of the IGBC, San Hill was again captured, this time by IG-88, a bounty hunter in service of the Zann Consortium. After the Empire's defeat at the Battle of Endor, following the death of Grand Admiral Thrawn, and the loss of the Core worlds to the New Republic, Muunilinst became the financial heart of the shrinking Empire. Many Imperial officers nicknamed the planet "Moneylend." It remained part of the Imperial Remnant during the New Republic years, protected by two Golan III battle platforms, defenses which Moff Disra had tried to move to Bastion. Amazingly, but again consistent with their reputation, even while a part of the Imperial Remnant, Muunilinst still became the guarantor of the New Republic credit. This infuriated the Moffs, but they were powerless to move against the IGBC without destabilizing the Imperial credit. Years later, during the Yuuzhan Vong invasion of the galaxy, the Yuuzhan Vong took control of the planet Coruscant and then were soundly defeated at the Battle of Ebaq, the alien invaders turned to the fringes of the galaxy to make smaller attacks. After destroying the Yevethan homeworld of N'zoth, the Yuuzhan Vong turned their attention to the Imperial Remnant. In a coordinated strike, the Yuuzhan Vong eliminated Bastion and its supporting fleet, then decimated the forces protecting Muunilinst. The planet itself was bombarded from orbit, reducing it to a wasteland from which the Yuuzhan Vong plucked any survivors for use as slave labor.